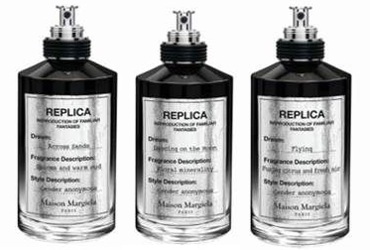 Maison Martin Margiela will launch four new unisex fragrances in the Replica series: Dancing on the Moon, Across Sands, Soul of The Forest and Flying. Dancing on the Moon ~ a white floral aldehydic. Across Sands ~ an oriental leather scent with oud. Soul of The Forest (not shown) ~ a green vegetal scent with "ancient wood". Flying ~ a cologne-style fragrance with citrus and fresh air. Maison Martin Margiela Replica Dancing on the Moon, Across Sands, Soul of The Forest and Flying will debut in September, in Eau de Parfum, size unknown.